This is an entry in the Dragon’s Dogma bestiary. You thought I had droppped this, didn’t you? The remaining entries along with the full adaptation can be found here. Like gryphons and chimeras, hydras are a heraldic animal in Gransys, symbolizing endurance in battle. Hydra sightings are vanishingly rare, for not many of these monsters exist in Gransys and even fewer people who saw one up close lived to tell the tale. 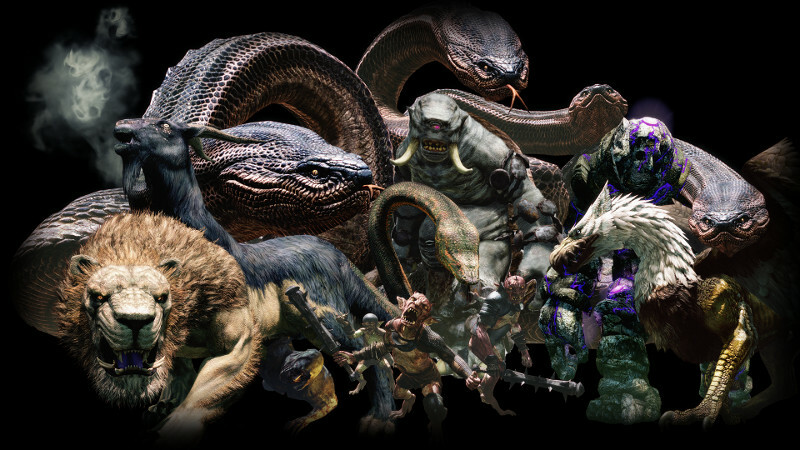 A Gransys hydra looks like a gigantic four-headed snake, covered in shiny black scales. Its four necks tower over the ground at the height of a cyclops, and its main body is even larger. Its four heads can spit a jet of numbing poison, and and swallow a grown man whole. Despite this, the creature lacks substantial fangs and its jaw muscles are more suited for immobilizing victims than for outright crushing them. Should the hydra have need of crushing someone, though, it can simply slam its heads, necks, or tail into the victim. Dodge 10; DR 6 (neck); 9 (elsewhere). Head Slam (15): 6d+3 crushing; Reach C-4; The hydra slams one of its heads into the target. Miasma Spit (15): A 2 meter radius area of effect in front of the hydra. Targets exposed to the venom must roll HT. Success means 1d injury, failure means 2d. Targets also suffer a -1 penalty to DX for every 2 injury sustained, which lasts for 1 minute. Costs 2 FP per use. Bite (15): The target is grappled with ST 52! In subsequent turns the hydra will attempt to swallow the target (treat it as an attempt to pin). See Notes below for how to rescue a swallowed target. Tail Sweep (15): 6d+3 crushing with double knockback; Targets a 3 meter radius area of effect behind the hydra. Can only be dodged, not parried or blocked! The hydra can do something with each of its heads each turn, or give up one head’s action for a tail sweep. Each head counts as a separate individual for the purposes of being targetted with mind-affecting spells or the like. Despite its feasome size and prowess, a hydra has the mind of a beast. It will usually attack because it’s hungry! In these cases, its usual tactic is to impair one of more targets with its Miasma Spit, then bite and swallow them. It will retreat once it has had its fill or suffered significant injury. Hydras are also highly territorial and will fight any who trespass on their lairs to the death. A cumulative 15 injury from cutting weapons to a neck will sever one of the hydra’s heads. 2d seconds later, the head will grow back, and the hydra will regain the lost HP. The stump must be burned with natural or magical fire to prevent this from happening! Severing and cauterizing the last head will of course kill the beast. Someone swallowed by a hydra can still be saved in the 10 seconds it takes for them to travel down the beast’s neck if the offending head is severed before then. If they reach the creature’s body they will automatically take 6d+2 cr damage per second from its innards, which practically guarantees a swift death. It’s possible for a brave or suicidal warrior to climb the neck of a hydra! It’s skin is mostly smooth but still provides some handholds, giving a -2 to any Climbing rolls. Someone clinging to the neck of a hydra can target the neck at no penalty with a one-handed melee weapon, but the beast can still attempt to crush the pest by slamming its neck against the ground. Treat this as a “Head Slam” attack. The target has a -2 penalty to Dodge it unless they let go of the hydra. The original game also features the “Archydra” in its most difficult dungeons, beyond the Rift. This variant is white instead of black, harder to hurt, and does have fangs. It has DR 9 in the neck and 12 elsewhere and can bite for 6d+2 imp damage instead of grappling if it wishes.